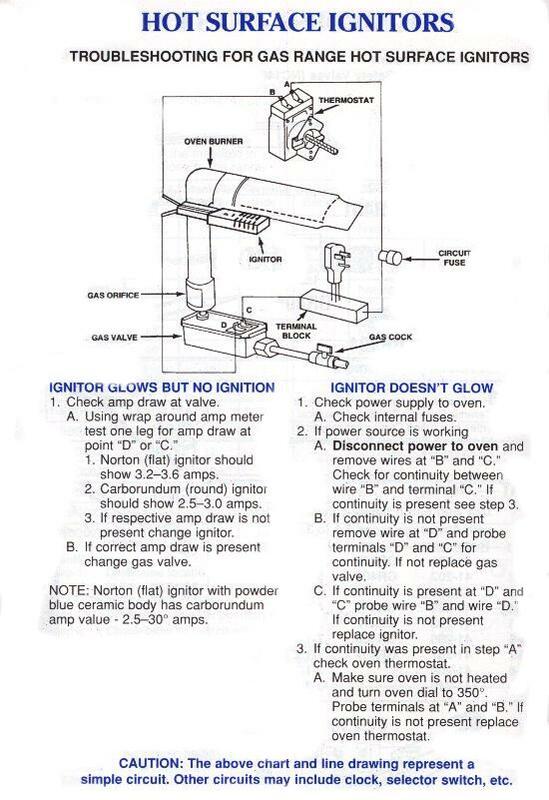 HowToRepairGuide.com: Ruud kitchen range igniter and gas valve troubleshooting? Ruud kitchen range igniter and gas valve troubleshooting? The hot surface igniter often looses it's ability to get hot enough to open the gas safety valve. The safety valve can fail, but most times it is just a bad hot surface igniter. The hot surface igniter can also quit part way through cooking , in other words the oven may cycle a couple of times and then it just sits there with the red glow from the igniter. Hot surface igniters do weaken and will eventually generate less heat than they normally could. When this happens they can still allow marginally correct current to flow to the oven gas valve for it to open but not get quite hot enough to ignite the gas burner immediately. When this happens, gas released into the oven can sometimes build up to the point where when finally ignited, the amount of gas lit can cause a small explosion inside the oven or cause an odor of gas with out the oven working. Yes, your glow bar igniter can glow orange-red and still be bad!! While the valves are very reliable, the igniters have become the most common parts failure on these systems. Labels: Ruud kitchen range igniter and gas valve troubleshooting.